With .NET you can develop stable and robust multithreaded applications with minimal effort. .NET Multithreading teaches the basics in an understandable and practical way. 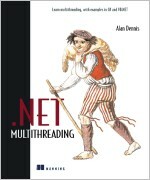 It then focuses on .NET's mechanisms for multithreading and shows how easy it can be to develop applications with them. The book covers several design approaches such as one-thread-one-class, the asynchronous design pattern, and using queues as buffers between threads. It explains best practices and how to avoid common multithreading pitfalls such as deadlock and race conditions. This book is written for intermediate .NET developers who know C# or VB .NET, but are not assumed to have a background in multithreading. It is rich in examples that will help you understand the subject and produce multithreaded applications that have the power of C++ while keeping the ease and reliability of .NET. This book focuses on the practical use of concurrency to implement naturally concurrent applications. In addition to a tutorial introduction to programming in Concurrent ML (CML), the book presents three extended examples using CML for practical systems programming: a parallel software build system, a simple concurrent window manager, and an implementation of distributed tuple spaces. CML, which is included as part of the SML of New Jersey (SML/NJ) distribution, combines the best features of concurrent programming and functional programming. This book also illustrates advanced SML programming techniques, and includes a chapter on the implementation of concurrency using features provided by the SML/NJ system. It will be of interest to programmers, students, and professional researchers working in computer language development. Over 12 years ago, Logica started the development of TestFrame, a test method which enables organizations to develop and execute their tests in a structured way. Since then. many new techniques have been developed, such as, most recently, "Service Oriented Architectures (SOAs)" or "Software as a Service (SaaS)," requiring updates to test procedures and processes that seemed well-established. These trends have prompted Logica to update and renew the TestFrame method. Chris Schotanus’ new book takes into account the recent developments and his presentation is focused on supporting daily test practice. Every step within this structured test method is dealt with exhaustively, providing the reader with the necessary details for successful software testing. Yet his book will not only help test personnel to improve effectivity, it will also serve as a way to improve efficiency through its strong focus on reuse. This makes TestFrame the practical guide to testing information systems for everyone involved in software testing -- test developers, test managers, and staff charged with quality assurance.